Lola’s Kitchen is a feature on Lola’s Reviews where I talk about all things related to food, cooking and baking. These posts can be recipe posts or more discussion type posts about food. I love cooking and spend some time in the kitchen almost every day, so I wanted to give it a place on my blog as well. The banner for this feature is designed by Michelle from Limabean Design. I just love curries, there’s something special about them. I used to buy a package with curry paste and make my curries with that, but eventually I decided I wanted to make them from scratch. 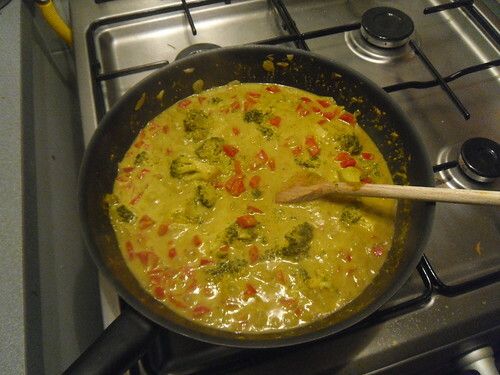 I have made a variaty of red curries before I finally took the risk to make a green curry. Green curries have a very different flavour then red curries and I had so much fun making an tweaking this recipe. 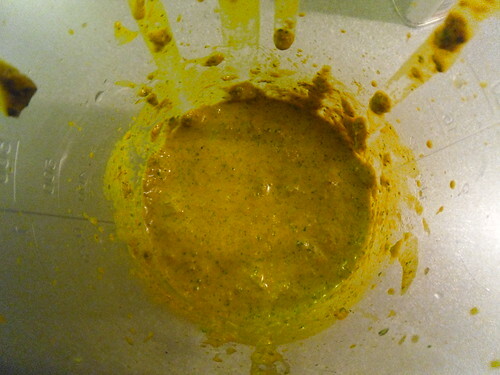 The green curry paste is based on the recipe by Spicie Foodie. This recipe feeds about 3-4 people. You need as many naan as people that are going to eat it. 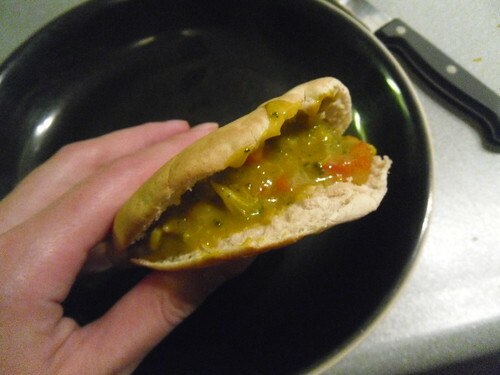 I often use pita bread instead of naan as it’s much cheaper. You can also serve with rice instead. If you like your food spicy feel free to throw in 3 or 4 chillies, the Spicie Foodie recipe said 4 chillies, but for me 2 is more then enough. 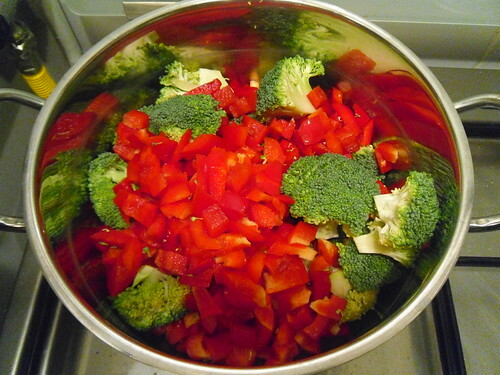 Cook all the raw vegetables except the onion for about 15-20 minutes, set aside. While the vegetables are cooking, prepare the green curry paste. Chop the garlic, coriander, lemon peel, lemon grass and green chillies. Remove the stems from the chilies and for a milder version remove the seeds as well. 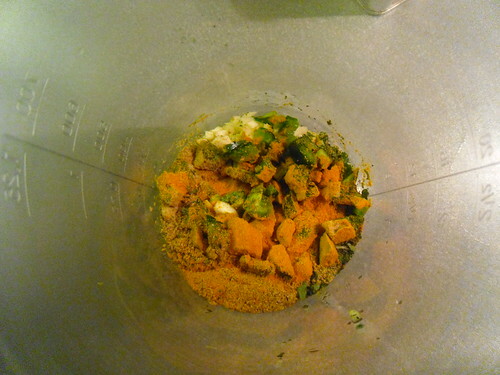 For a spicier version keep the seeds.Next place all the vegetables, spices, the soysauce and the oil into a blender. Blend until you have a thick paste. If it’s too dry add either a bit of water or more oil to smooth out the paste. 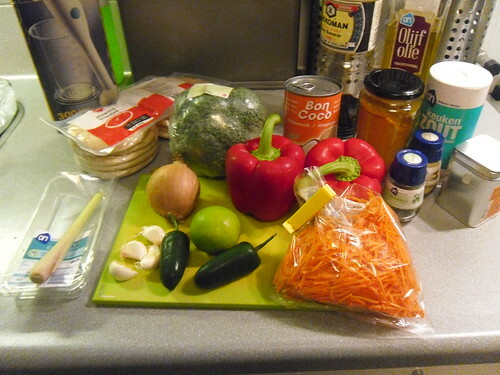 When the paste is made and the vegetables cooked, it’s time to assemble the curry. In a medium or large saucepan or wok heat the olive oil and bake the onion until translucent. If serving with rice start cooking the rice now. If serving with naan preheat the oven for the naan, about 180 degrees celcius or 350 degrees Fahrenheit. Or check the package for the temperatures. Then add the curry paste and the coconut oil. Stir well and cook for a few minutes. Prepare the naan or pita bread and serve with the curry. Enjoy! Vary with vegetables. Try this recipe with your favourite vegetables. In my opinion almost every vegetable would work well with this. I usually throw in paprika, lentils, brocoli, potatoes or green peas. But I think green beans, cauliflower, corn or other vegetables would fit great as well! Have you ever made green curry or are you planning to try it? Yeah most curries are somewhere in colour ranging from yellow to red. I also have to admit that this green curry, doesn’t look really green, but mroe a bit of a greneish yellow, but they call it green curry. Hope you give it a try :). I find that green curries always have a very different flavour then yellow or red curries, so it’s certainly worth a try. Sure, you’re welcome to drop by when you’re in the area ;). I love curries as well and have about 3 more curry posts scheduled as recipe posts. Paprika is a vegetable?? I always thought it was a spice, since that’s where I buy it (the spice aisle in the store.) I love it as a spice, but had no idea it was a veggie. Now I’m going to have to track this down and see what it tastes like not powdered! *laughs* How do you cook it? Silvara recently posted…Fantasy Creature Friday – Lamia! Uhm it’s also called red bell pepper I think? Ugh my non-native speaker ness is really showing with these posts. I actually once ordered paprika in a french restaurant while on vacation and got the spice instead of the vegetable. Don’t worry about not being a native speaker of english. *grins* I love learning new-to-me stuff, and so far nothing I’ve seen hasn’t made sense to me. I never would have known paprika was made from peppers. Mostly because I never actually looked it up. I just like using it to cook with! So thanks for mentioning it! The weird thing is here we call the vegetable paprika and the spice is also called paprika, but I keep forgetting that in english it’s paprika as a spice and red bell pepper as a vegetable. I changed the wording in this and future recipe posts so I don’t confuse anyone. I also had a slight miscommunication in my post of last week about risotto rice, lol, I keep learnign new things as well. And I can understand that with the different words you don’t realize that paprika powder is actually made from red bell peppers. I also like cooking with paprika powder, I have a tofu korma recipe coming up somehwere this month which uses a lot of paprika powder. And I like the colour of paprika powder, it’s such a beautifull deep red colour. Same here, ever since I ate at an indian restaurant last summer I keep making different curries. Yum! I love green curry and often make a green curry coconut stir fry, Thai style, and have it over rice. So yummy. I really grew to like green curry as it tastes so different from most other curries. Oh that green curry coconut stir fry sounds yummy as well! Which country are you from? And indeed most curries are brown/ yellow. orange or red-ish, but I like green curry for being unique :). The flavour is also very different from brownish curries. There will be recipe post for brownish curries coming soon as well. Oh I didn’t know that. You probably eat curry quite regulary then. I love green curry but the spicier the better for me! So I’ll be adding those chillies in! I haven’t made the curry paste myself before but it’s less intimidating than I thought it would be. You make it all sound so easy! There really is a limit on how much spicyness I can endure and my limit is pretty low, usually when I am almost burning my mouth away, my boyfriend and sister finally taste a bit of the burning. So yes if you love spiceness add in those extra chillies, you can also add some cayenne pepper or madras if you have that for a spicier taste. I thought making my own curry paste was pretty daunting at first, but it’s easier then it sounds and it makes for a great curry. OMG, this looks AMAZING. I love curries too. How long did it take you make it?? About an hour I think. 10-15 minutes for chopping the veggies, 20 minutes cooking the veggies while I make the paste and then another 15 minutes for assembling and cooking.